Hamas has claimed victory over Israel in the fighting that ended this week but the paucity of flag waving fighters and supporters raises serious issues about any Hamas glory. Even the rival Fatah party in Gaza can’t find it appropriate to gloat over the proclaimed “victory” over Israel. Hamas and Fatah are in disagreement on everything. Fatah says Hamas relied too much on Iran for strategy and arms, irresponsibly goaded Isreal into a war with their rocket attacks on Israel, and botched the defense of the Gazan people. CNN reported that some in Fatah are accusing Hamas of carrying out “punishment shootings” against suspects. “In this war, we arrested many spies and collaborators, and we will stay continuing to catch these spies and put them in jail and in court,” Ehad al-Ghossain, Hamas’ Interior Ministry spokesman, told CNN. Students storm the British Embassy residence compound in Tehran, Iran, ripping down the Union Jack and hoisting the Palestinian flag, while Iranian President Mahmoud Ahmadinejad proposes to try Israeli leaders in absentia. An Iranian religious organization signs up volunteers for suicide operations in the Gaza Strip, and an Iranian general suggests an Islamic military response to the five-day Israeli offensive against Hamas. With bellicose rhetoric, the Islamic Republic of Iran has taken the lead in opposing the ongoing Israeli military operation in Gaza. The vociferous public displays, analysts say, are aimed primarily at hard-core government supporters in Iran whom officials hope to energize before presidential elections in June. But the high-profile maneuvers are a double-edged sword, because they also reinforce perceptions in Israel, the United States and large parts of the Arab world of links between Iran and Hamas, which took control of Gaza in mid-2007. Israeli leaders and their U.S. allies have framed the fight against Hamas as one against an Iranian proxy firing Iranian-supplied rockets deeper inside the Jewish state. In a CBS interview Tuesday, former Israeli Prime Minister Benjamin Netanyahu called Hamas Iran’s “terrorist base” next to Israel. But Iran’s main ally in the region — the Shiite militia Hezbollah — has all but ruled out military intervention on behalf of Hamas, while Iran’s supreme leader, Ayatollah Ali Khamenei, has carefully condoned “defending” Gazans without calling for killing Israelis. Even the hair-raising idea of a military response was delivered not by a ranking officer in charge of Iran’s land, sea or air forces, but by the general technically in charge of annual ceremonies commemorating those who fought and died in the Iran-Iraq war in the 1980s. “They are mobilizing their power base to set the tone for the main issues of the presidential campaign,” said researcher Shahram Kholdi, at the University of Manchester, England. In taking this tack, Iran also can appeal to hard-line Islamists in rival Arab nations. Meanwhile, Iran has intensified repression against its own moderate and reformist opponents. Authorities Wednesday shut down the daily newspaper Kargozaran, which is often critical of Ahmadinejad and close to rival Ayatollah Hashemi Rafsanjani…..
A senior Russian diplomat harshly criticised the US stance in arms control talks yesterday, saying it could further erode mutual trust and undermine global stability. The US and Russia have begun talks on a successor deal to the 1991 Strategic Arms Reduction Treaty which expires in December 2009, but a cold spell in Russia-US relations has stymied talks. Russia’s Deputy Foreign Minister Sergei Ryabkov said that Russian and US negotiators have failed to agree on which weapons should be counted under the new deal. Russia wants to count missiles, bombers and submarines along with nuclear warheads fitted to them, as was done in the START I treaty, while the United States agrees only to count nuclear warheads, Ryabkov said. “The implementation of the approach proposed by the American side can strip our bilateral relations of a key element – predictability in arms control – and badly destabilise the strategic situation,” Ryabkov said in a statement. US officials argued that missiles, bombers and submarines mustn’t be subject to a nuclear arms control deal because they can also carry conventional weapons. Russia Testing Obama: Says No To U.S.
Pirates holding a ship full of tanks and ammunition off the coast of Somalia are likely to be paid millions of dollars in ransom within days, senior U.S. military officials said. The pirates have been holding the Ukrainian-operated, Belize-flagged MV Faina and its 20-person crew in the Gulf of Aden since September 25. 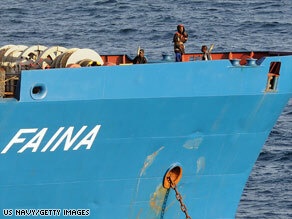 Somali pirates holding the MV Faina stand guard on the merchant vessel’s deck on October 19. Military officials said the cash payment will be brought on the ship, directly to the pirates. Such a procedure is common because of the lack of electronic banking in Somalia. The officials would not say how much ransom is being paid or who is paying it because it would be up to the individuals or company to make that announcement. What’s known is that the pirates originally asked for a $35 million ransom, but lowered their demand to $20 million, Andrew Mwangura of the Kenya Seafarers Association told CNN in November. The ship is laden with Soviet-era tanks, tank artillery shells, grenade launchers and small arms. You are currently browsing the archives for the arms category.